Even if the glass panes were sanded when they were cut, run a piece of fine sand paper along the edges, then wipe them clean. 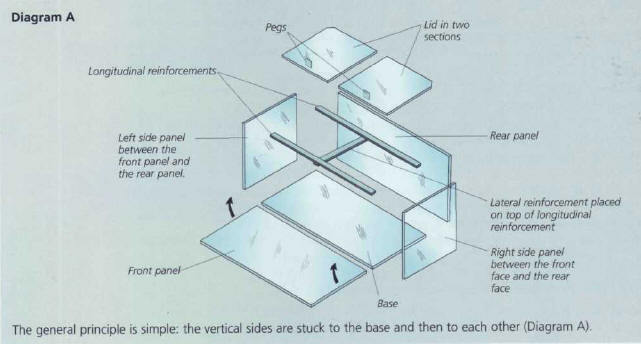 Lay the panes flat, as in diagram B. Clean the parts to be glued with the acetone or methylated spirits. These areas must not come in contact with your hands, so the panes must only be handled by their future top edge. Then allow to dry (it dries quickly). 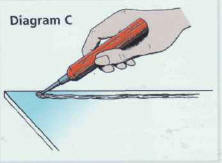 Apply the glue parallel to the edge of the pane (diagram C). Put one of the two large panels in place, then the two small ones (diagrams D and E). Note the position of the hands on the top edge of the panels. 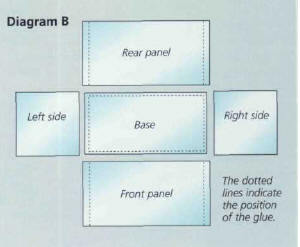 Finish off by putting the second large panel in place (diagram F). If you are planning to use decoration made of synthetic materials, do not put the front pane in place straight-away, so that you can add it in greater comfort. Once you are through, finish off the gluing of the tank. Apply pressure to the areas which have been glued, to eliminate any air bubbles - this is extremely important. It is quite normal for the glue to squeeze out on both the inside and outside. 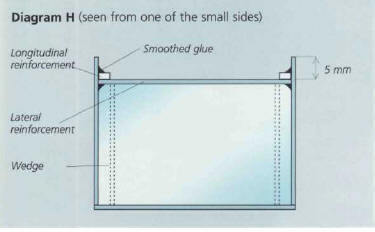 Use the sticky tape on the outer side to keep the four vertical panes upright (diagram G). Moisten a finger in the receptacle containing water, then smooth down the glue on the inside of the aquarium. The result must be concave. Glue the reinforcements, wedge them, and smooth down the glue (diagram H). Stick the pegs on the lids. Leave to dry for 48 hours. Carefully trim any excess glue on the outside and any smudges on the inside. Make sure you do not damage the parts you previously smoothed down. 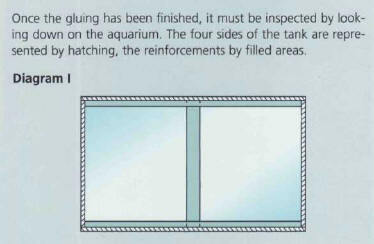 Place the aquarium on an absolutely flat surface and pour in water, to check whether it is watertight. The whole gluing process must be finished in 3 minutes, but there is no point in rushing: bad gluing can have disastrous consequences for the stability and watertightness of the tank. the pieces may not fit together properly. In the latter two cases, leave to dry, unstick, scrape off the glue with a cutter, clean, and then mount the tank again. If the aquarium leaks, indicate the source with a felt pen or sticky tape, then empty the tank and leave it to dry. Clean the defective area and reapply the glue on the inside, making sure to extend beyond both edges of the source of the leak. ЛОДОЧНИКОВ Владимир Никитович (Лодочникянц , Новакян Вартан Нерсесович) (1887-1943), российский геолог и петрограф, профессор Ленинградского горного института (1922-30). Труды по методам исследования минералов, теоретическим проблемам петрологии (в т. ч. по происхождению серпентинитов).